Sometimes the simplest things bring me joy in the kitchen. One of them for sure is my personal recipe box. Memories of good times or loved ones come to mind as I go through 3×5” cards. Each card is adorned with handwritten notes of family treasured recipes or ones I had cut and pasted from some of my favorite cooking magazines. 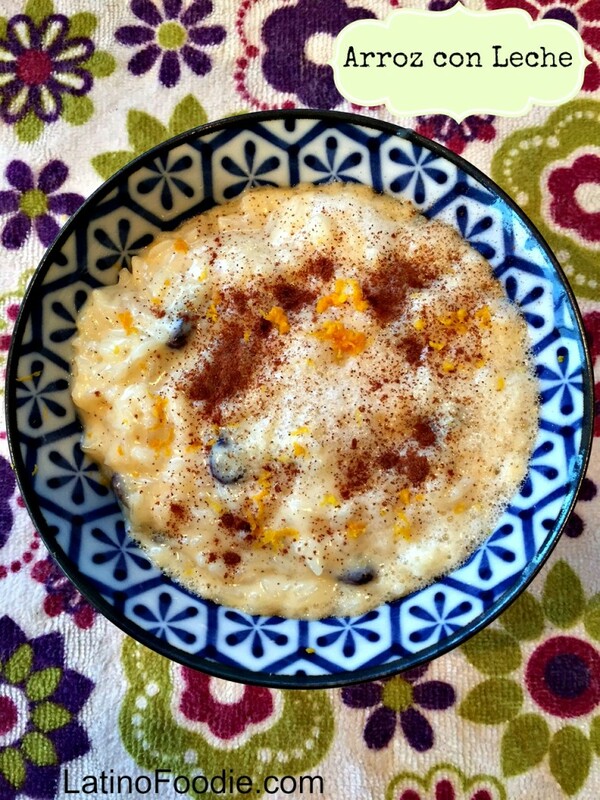 This year I found my maternal Grandma Dolly’s recipe for Arroz con Leche (rice pudding). Grandma Dolly died when I was only about five-years-old so unfortunately I didn’t get a chance to try hers. My mom would make it this way every so often, but eventually she would prepare the milk dessert the way my dad’s mom made it. My mom’s youngest sister, Aunt Penny, who thankfully also serves as our Tafoya family’s historian, sent the recipe to me a few years back. When I asked her about her memories of my grandmother making the rice pudding, she had this to say,”When I was little, Mama often made this dessert for her seven hungry children. She used to make it with raisins, but I never did like it that way. I liked it even less when my brother told me the raisins were flies!” Personally, I like raisins and today will play with it adding mango chunks, bananas, dried apricots. It’s such a sweet blank canvas to make it all your own. What makes this arroz con leche recipe different than others I’ve tasted are what my grandmother did with the yolk and egg whites. Gently folding in the beaten yolk into the warm sweet milk and rice mixture transforms the liquid into a thick, custard creaminess. Whisking the egg whites until they are stiff in a large serving bowl and pouring the milk and rice mixture on top gives another layer of flavor and merengue-like texture to the dish. The clouds of egg whites float up to the top of the bowl making it such a pretty presentation. Thank you, tia, for sharing this recipe with me. I’ll be making Grandma Dolly’s Arroz con Leche for years to come! In a medium/large stock pot, bring water to a boil. Add rice and salt. Stir a few times and then cover. Reduce flame to low and cook rice for 20 minutes. Remove pan from heat and uncover. Add milk, sugar, cinnamon stick, condensed milk, raisins, and vanilla. Cook over medium-low heat for about 15 minutes, stirring often so the milk does not burn. While the milk and rice mixture is cooking, beat the yolks in a small bowl. Gently add in a few tablespoons of the warm milk mixture to temper the yolks. Add the tempered yolks to the rice and milk mixture, stirring frequently. Remove the rice and milk mixture from the heat. In a large serving bowl, beat the egg whites until they are fluffy and begin to peak. Poor hot rice mixture over stiff egg whites with minimal stirring. You’ll see the clouds of egg whites will rise to the top of the bowl.